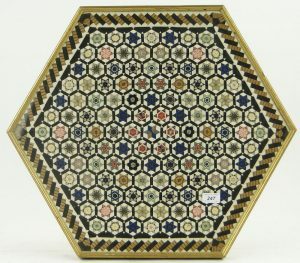 This astonishing piece of mosaic patchwork is hand-pieced with incredible precision from silk ribbons. How large do you think this is? Look at this close-up to help you decide before you read on….. 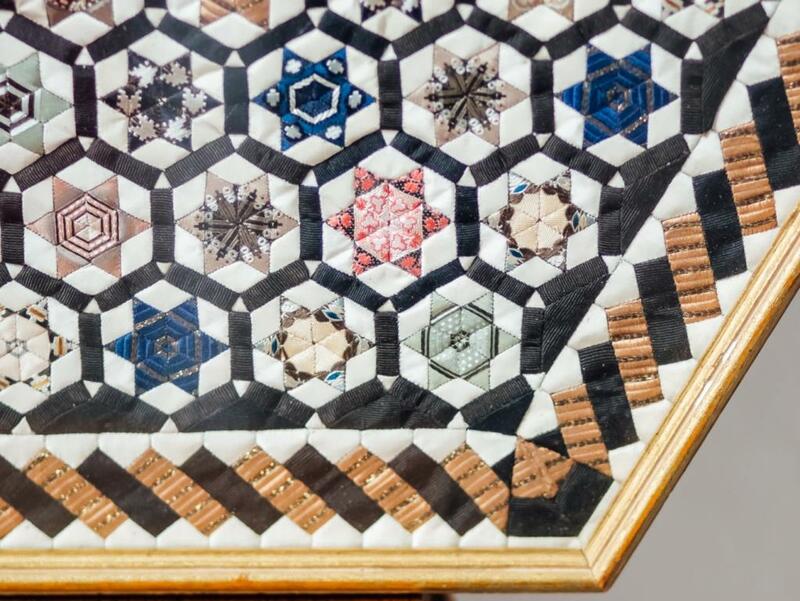 The whole patchwork measures only 24 ½” across at the widest point. is a mere 1 ½” across, with the tiny white triangles only measuring ¼” (0.5 cm) along each edge. 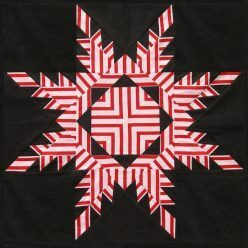 The ribbons have been carefully fussy-cut so that the stripes and motifs create secondary patterns. Look at the close-up below, together with the full image at the top of the page – can you identify all of the places where these stars are placed in the overall design? The mathematical way of describing this would be to say that the whole design has six-fold rotational symmetry. 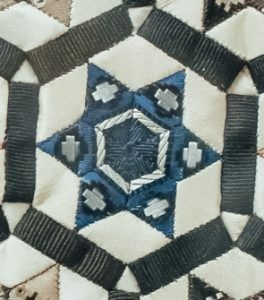 The edges are finished with filling triangles of the black grosgrain ribbon. A border of slanting black and tan rectangles, complete with well-planned corners, frames the whole design. The edges are finished with a border of black and tan rectangles set at an angle. Unfortunately nothing is known about the maker – the piece was bought from an auction house in Battle, East Sussex, who were only able to tell me that it came from a local house. When was it made? 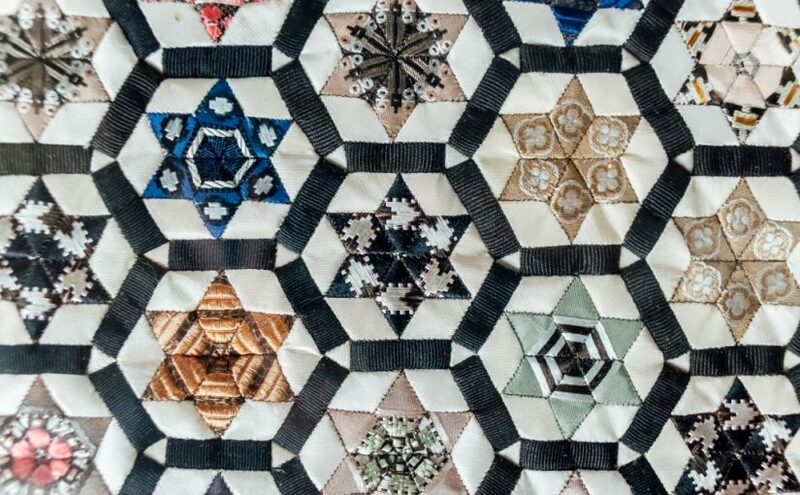 So far, the only information I have been able to find about silk ribbon patchwork is from Quilt Treasures of the British Isles published by the Quilters Guild in 1995. 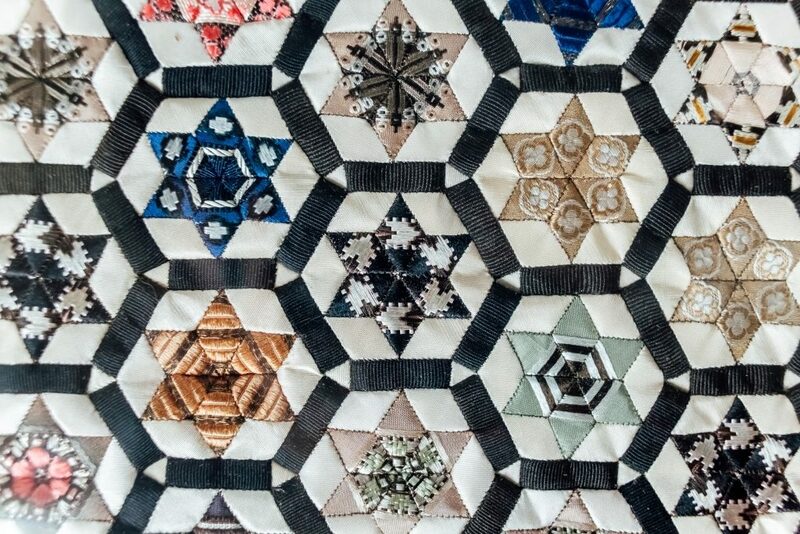 On page 191 there is a picture of some similar patchwork, and Deryn O’Connor and Tina Fenwick-Smith, the authors of this chapter caption it with a description of 1880 – 1920 as “The great period of quilts made from silk ribbons”. Coventry was a centre for weaving silk ribbons from about 1700 to the middle of the twentieth century. The Herbert Art Gallery and Museum has online photos of some of the pages from the 200 sample books of ribbons in the Herbert Silk Weaving Collection – click on the image of the loom to see some of their collection of ribbons. 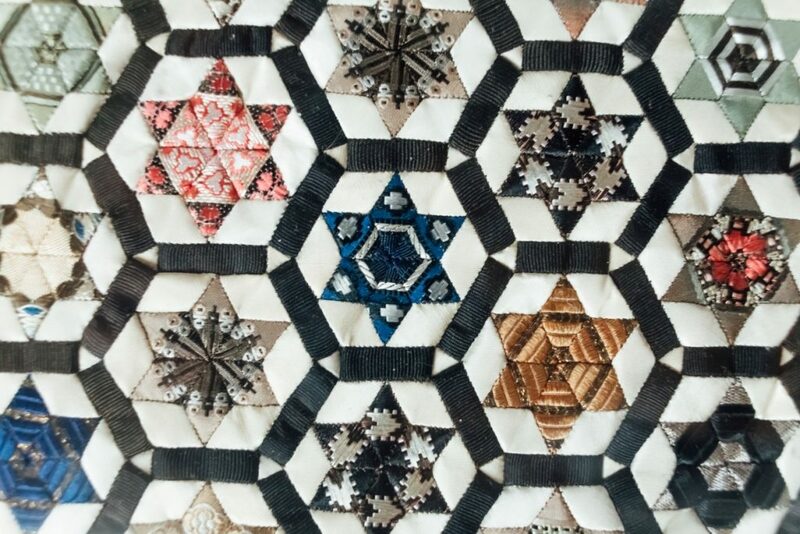 Unfortunately, I have not yet been able to identify any of the ribbons in this patchwork. 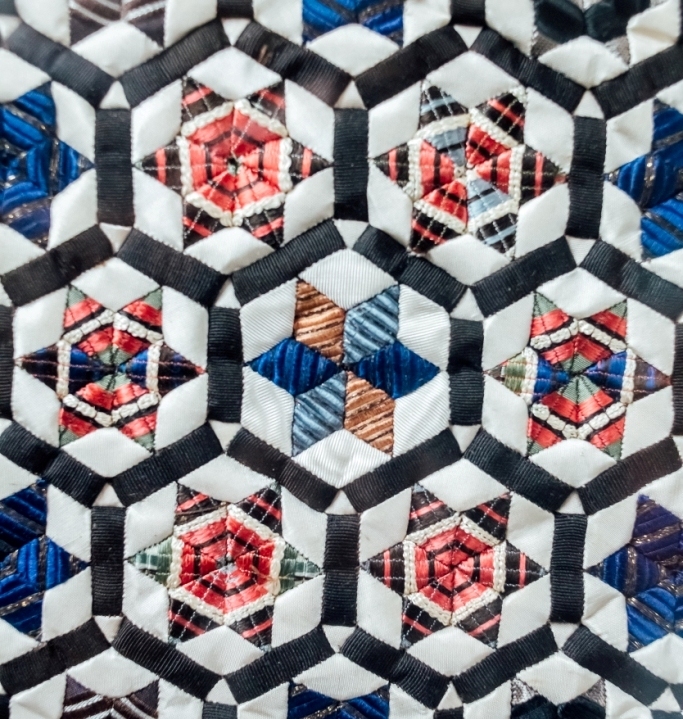 When it was displayed on the British Quilt Study Group stand at the Festival of Quilts 2017, this item attracted a lot of interest, and it is clear that silk ribbon patchwork on this tiny scale is very uncommon. 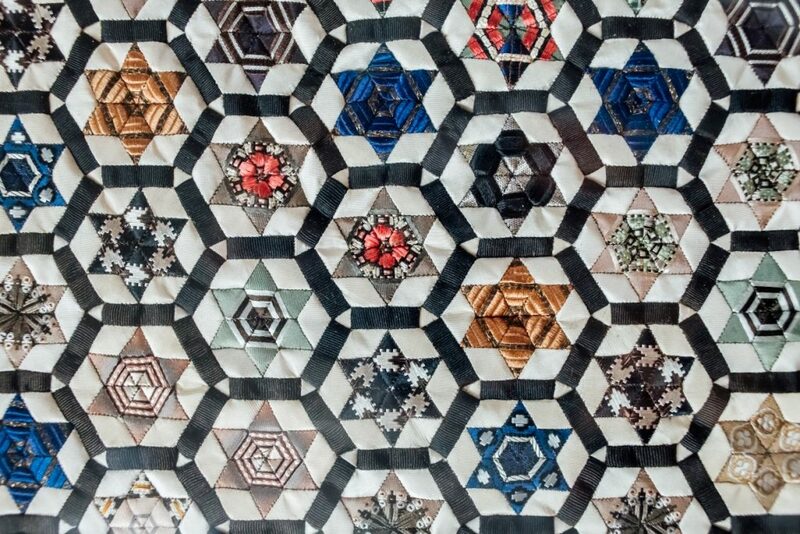 Hence I have agreed to offer it to the Quilters Guild collection – when I can bear to part with it.